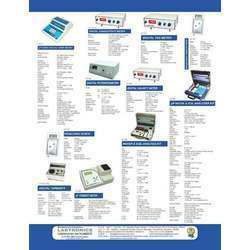 We are a leading and renowned manufacturer & exporters of UV-VIS spectrophotometers, viscometers, polarimeters, digital melting point apparatus, digital deluxe ph meter, digital conductivity meter, digital flame photometer, auto karl fischer titrimeter, turbidity meters, colony counters, water & soil analysis kits, tds/salinity meters, potentiometers, dissolved oxygen meters, digital spectrophotometer etc. These have application in diverse sectors such as chemistry labs, biotechnology, food and beverages, mines and geology, plants and dyes, pharmaceuticals, sewage plants, textiles, etc. 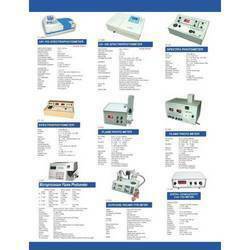 We are a leading and renowned manufacturer & exporters of science laboratory equipments like digital deluxe Ph meter, digital conductivity meter, digital flame photometer, auto karl fischer titrimeter, turbidity meters, colony counters, water & soil analysis kits, TDS/salinity meters, potentiometers, dissolved oxygen meters, digital spectrophotometer etc. These have application in diverse sectors such as chemistry labs, biotechnology, food and beverages, mines and geology, plants and dyes, pharmaceuticals, sewage plants, textiles, etc.